September is here, bringing with it the sweet promise of fall. Here in Salem, Massachusetts, that means crisp air, changing leaves, apple picking, and busy preparations for “Haunted Happenings,” October’s month-long celebration of Halloween. 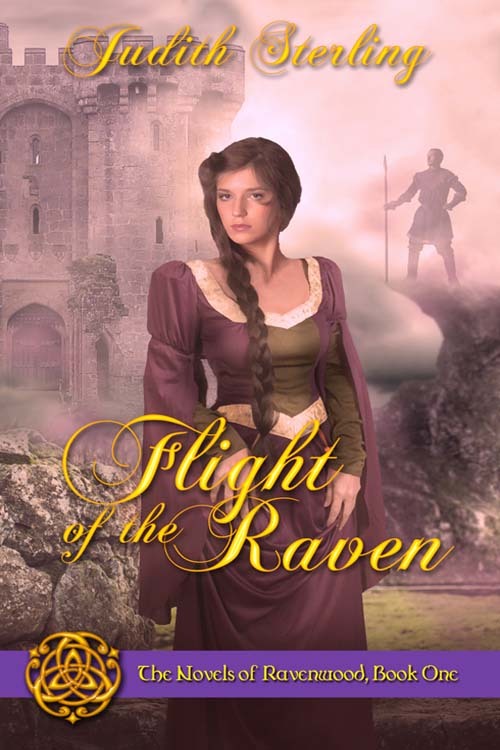 In my medieval romance Flight of the Raven, September of 1101 sees the arranged marriage of Lady Emma of Ravenwood Keep and Sir William l’Orage (William the Storm). When the Saxon lady denies her Norman bridegroom’s right to the marriage bed, sparks fly. He’s bent on founding a dynasty. Her life depends on her refusal. Together, they face a centuries-old curse and learn the alchemy of love. “Lady Emma?” a deep, male voice snapped from behind. At the edge of Woden’s Circle loomed a figure dark as midnight’s soul. The wind whipped the man’s sable, jaw-length hair into a frenzy about the smooth, hard lines of his clean-shaven face. His thick, black mantle was a living thing, swirling around his tall, imposing frame as though it fought to contain the raw masculinity within. Emma steeled herself. “Who wishes to know?” Her words were more bravado than question. He could be only one man. “Sir William l’Orage,” he said in a low, controlled voice. He stood perfectly still for several long, excruciating seconds. She’d intended to approach him, but her feet remained rooted to the ground. She just stood there, returning his stare with equal intensity. He’s studying me, she thought, as if I were some citadel to which he might lay siege. Suddenly, he advanced toward her. Each step was powerful, potent. The closer he came, the stronger was his presence. He halted an arm’s length away, and she fancied his aura reached out to hers. His energy was virile, brimming with authority, and in a strange new way, attractive. “Did you forget my arrival today?” His voice was calm, but his clear, black eyes glistened with a darker emotion. A loud croak sliced the air amid a flutter of wings. He nodded. Then he turned his head and stared into the shadowed forest. “You’ll find them always underfoot,” she said. “Hence the name of the estate.” He turned back to her. She could think of nothing to say. She hesitated, then stepped out of the stone doorway which had seemed a haven. A blast of cold air grabbed her cloak, and she felt even more vulnerable. The wind was now sharp and demanding. Pulling her mantle close about her, she walked beside her future husband. She accepted his silence and kept a comfortable distance between them. Outside the sacred circle, she paused. A black beast regarded her with giant eyes. The warhorse neighed fiercely at the sound of his name. William stopped abruptly, but she continued on toward the animal. “Good day to you, Thunder,” she cooed. She touched his side experimentally. The stallion’s muscles twitched beneath her hand. He seemed to exude a power equal to his master’s. Yet Thunder calmed and whinnied when she lengthened the caress. Her fingers traced a slow pattern over the animal’s smooth, shiny coat, and she lost herself in the pleasure of the moment. Like a clever thief, William appeared at her side. She looked up, startled. Eyes the color of Satan’s dreams bored into hers, sending a rush of alarm to the base of her spine. “Most people fear him,” William murmured. William’s large hands slid beneath her woolen mantle and locked around her waist. She was about to protest when he hoisted her onto Thunder’s back. Then he swung himself into the saddle behind her. She avoided his gaze. He was too close, too warm. “I prefer to walk,” she said. “Nonsense.” He prompted Thunder with his knightly spurs. The warhorse began to move. “I see,” she said, but she didn’t. Nor did she care at the moment. Her bridegroom was a stranger, and an arrogant one at that. She would hold her tongue. He might think her rude, but her well of conversation had run dry. For the short ride home, she focused on the expansive countryside, where hill and dale lay abandoned by the morning mist.